HAVANA TIMES (Nov. 24) — On Tuesday the foreign ministers of eleven countries including all of Central America plus Colombia, Ecuador, Mexico and Cuba, meet in the capital of El Salvador to try to find a solution to the Cuban migrant crisis affecting all the nations on the route from Ecuador north to the United States. 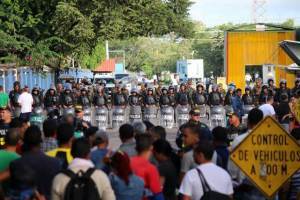 Over three thousand Cubans are now stuck in Costa Rica, most in temporary shelters, with transit visas giving them free passage to the Nicaraguan border, but that country has barricaded up its border to the Cubans using riot police and the army to keep them out. The Cubans, who often sell their homes and possessions to pay people traffickers and make the dangerous trip, land legally in Ecuador, which is the only country on the continent with open doors to the islanders as they do not require a visa. Then they move by land or water through jungles, plains and mountains trying to make the over three thousand mile journey to the United States. These same Cubans, most refused a visa to visit the US when requested at the US embassy in Havana, will be warmly welcomed by immigration officials under the Cuban Adjustment Act if they reach a US border post. If they don’t make it, that’s their tough luck. According to the Obama administration, there is no current intention to repeal the Adjustment Act. The law provides Cubans a work permit, financial assistance and a fast track to permanent residency, which no other nationality receives in mass. The Act, passed in 1966, is a holdover of the Cold War that couples with the more than half-century economic and financial embargo still imposed on the island. While the strange bedfellows of the Cuban Government and hardline anti-Castro exiles, including presidential hopefull Marco Rubio, want the law repealed or deeply modified, the status quo inertia appears to be considerably stronger going into an election year. The Communist Party’s economic reforms in Cuba have not reached the vast majority of the working population, apart from a small new class of prosperous business owners, some artists and athletes, and a segment of the population working in the tourism industry. Likewise, increased tourism and self-employment without wholesale markets or import licenses, have only exasperated the shortages of many products faced by consumers. Many young Cubans, both university educated professionals and those with a lower educational level, aspire to immigrate to another country since their vision of the future in Cuba remains grim. The island’s aging population is in part due to a large number of Cuban women not wanting to have children until they have a financial situation that will allow them and their partners to have private living quarters and buy basic consumer products. Emigration is seen as the only way they can ever reach these goals and have a family. The meeting today of the foreign ministers in San Salvador seeks to resolve the situation of the growing number of Cubans on the Costa Rican-Nicaraguan border and also address the general situation of illegal migration in Central America.